There were some observations that I made regarding all colours which I find easier to address first before repeating myself over and over. I find that each shade lives up to the plumping claims with a couple being less plumping than others (such as Power Trip). They all had a certain amount of tingling, but a couple were more so and some were far less so. I found the longevity to be around two-three hours so it will need re-applying throughout the day. Pucker Up is a bright, Barbie pink. It is a vivid colour, but it does get into the creases on your lips after a while. In The Buff is one of the neutral shades of the collection. On me, it looks just like my normal lip colour so it can be a little hard to tell that I'm even wearing lipstick. I find it to be the "tingliest" shade of the collection, but it is as plumping as the other colours. Shade wise, Hot Pants instantly made me think of my beloved Mirenesse Mattfinity Lip Rouge in Sydney, but with a satin finish rather than matte. It is a bright, pinky red that applies smoothly and evenly. Uptown Pink provides a good, even colour that doesn't get into the creases on your lips. It is a slightly darker rosy-pink than Stolen Kisses (below). Divine Wine is a BEAUTIFUL shade for autumn/winter! It has a frosted/satin finish and is one of my unexpected favourites of the bunch. The photo above doesn't really do it justice which is a total shame, but in person it looks fab. Mad About Mauve is the sheerest shade of the collection and sadly probably my least favourite of the lot even though I expected to really like it. It settles into lip creases straight away, too. It seems that I am not mad about this mauve! Stolen Kisses shows up dry patches of the lips so make sure that the lips are well exfoliated before application! It is a rosy pink shade that is perfect for casual times. Wowza! What a stunning shade! Bitten is easily my favourite shade of the entire collection in terms of both colour and application. It has the most vivid, opaque colour of the bunch. If you like the brighter, in your face shades, this is the one you want. Twig is a darker natural shade than In The Buff. As a heads up, the book photo of this shade depicts it as being darker than it is. It's great for autumn/winter! Power Trip is the token red with blue undertones of this collection. It is opaque, not the most tingly or plumping but you can notice difference. If you need lip liner with any shade here, this is probably the one. Overall, I think that this is a pretty good collection with some definite stand-outs and an odd disappointment. In regards to vividness, Bitten is stunning. The shade is bright, cheerful and loud, perfect for nights out or parties. The nudes are lovely shades, but I prefer Twig over In The Buff, but this may be down to the fact that In The Buff is a little too close/the same colour as my lips. Divine Wine was the surprise for me and personally I don't think that the photo does it enough justice. In person it is absolutely beautiful and is one that I'll be reaching for during the colder seasons for sure. Mad About Mauve was the weak point of this range. In the tube the lilac shade looks gorgeous, but once it's applied on the lips it just seems to disappear. 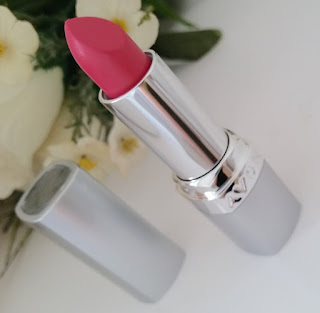 Avon's Ultra Colour 3D Plumping Lipstick's will be available from Campaign 16. I'll update the post with a link to purchase them as soon as they are available online. UPDATE! - They are now available to buy online in the UK for £5 each (and then £8) from my Avon store (UK only, courier delivery only). What are your thoughts on Avon's new Ultra Colour 3D Plumping Lipsticks? What's your favourite shade?